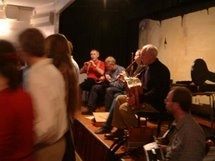 We are very fortunate to have many talented musicians who play for our dancing. The instruments are typically the hurdy gurdy, French bagpipes and accordions.... plus fiddles, all types of woodwind instruments, and a whole range of others. Before our dancing starts at 1.00pm we have a music practice session in the hall, starting at 12.00. If you want to join us you will be very welcome, no matter what your level of experience. For those of you that read music we can email you the music we are trying to learn so that you can practice the tunes before each session.